We added American guinea hogs to our farm in November 2010. They are the original American homestead hog. Historically, they lived on homesteads and ate whatever was available — garden produce, nuts, snakes, rats, and so on. Our guinea hogs live in the pasture and eat plenty of grass and weeds, as well as whatever is available seasonally. During the summer, that means lots of overgrown zucchini, and during the fall, that means winter squash from our garden, as well as acorns and hickory nuts that they find on their own as we move them around the farm to graze under the hickory and oak trees. They are also fed hay during the winter, spent brew grain, corn, oats, fresh milk from our cow or goats, eggs from our chickens, and scraps from our kitchen. However, they are NEVER fed pork or any food that contains artificial ingredients. We started with one pair of guinea hogs — Julia Child and James Beard, named for famous chefs because they’ll be making excellent pork for us. To keep up with demand for pork and breeding stock, we’ve kept two of Julia’s daughters, Alice Waters and Rachel Ray. We sold James Beard, and purchased two unrelated boars for breeding. 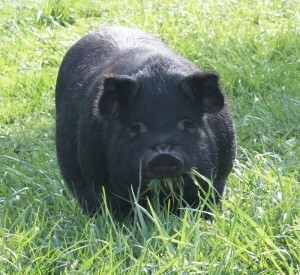 We have three to five litters of piglets per year and sell breeding pairs or trios, as well as pork. Unlike modern pork breeds, guinea hogs are much smaller. Mature weights are in the 200-300 pound range, so rather than having a 200-pound hanging weight for a processed pig, it will probably be closer to 100 pounds. 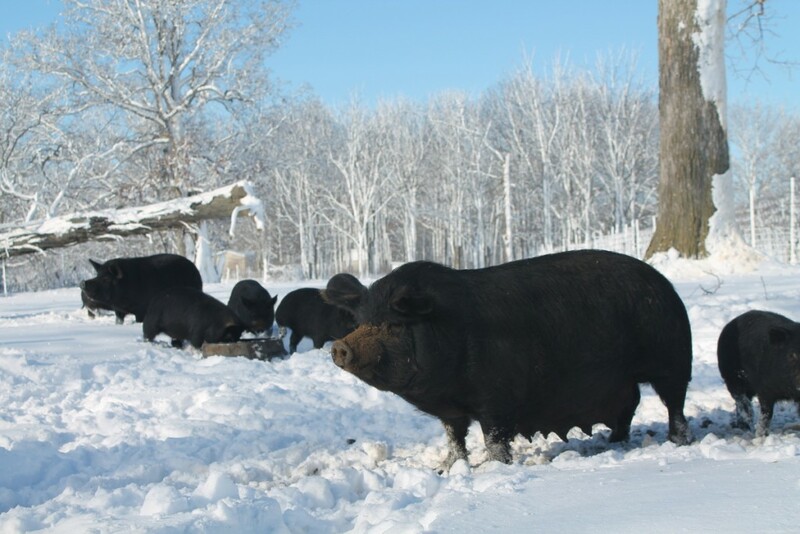 This also makes them much more manageable than the typical commercial hog that weighs 800 pounds or more at maturity. My favorite thing about guinea hogs is their wonderful personalities. They are extremely sweet, and most will roll over for a belly rub. In fact, if gilts won’t roll over for a belly rub, they get sent to the locker. 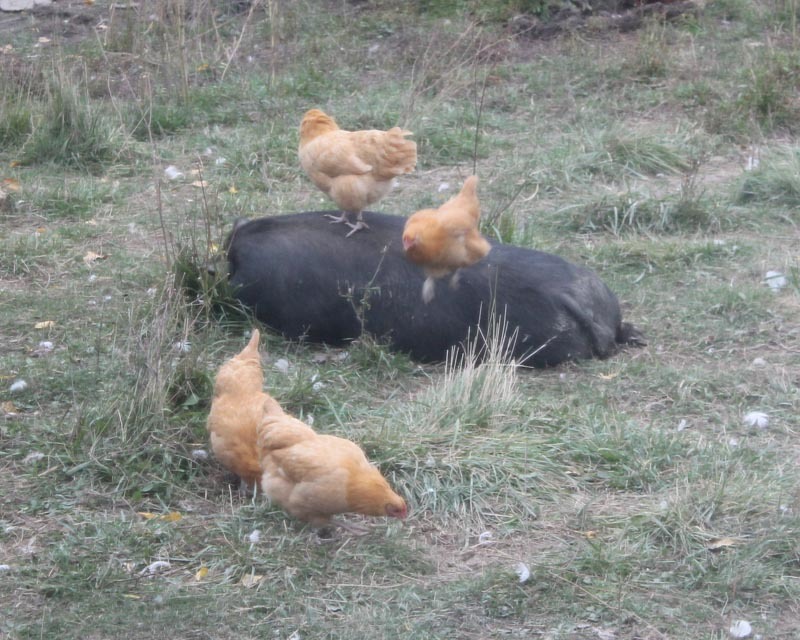 They will happily share the pasture with other livestock and will even share a pan of grain with the chickens. We had piglets on our farm from 2004 through 2010 as temporary residents. We referred to them as “temporary” because they were only here for about six months. We purchased Tamworth piglets at weaning from a farmer who raised them without antibiotics or vaccines, and we raised them on pasture until their hanging weight would be 150 to 200 pounds, at which point they were sent to the processor to become pork. 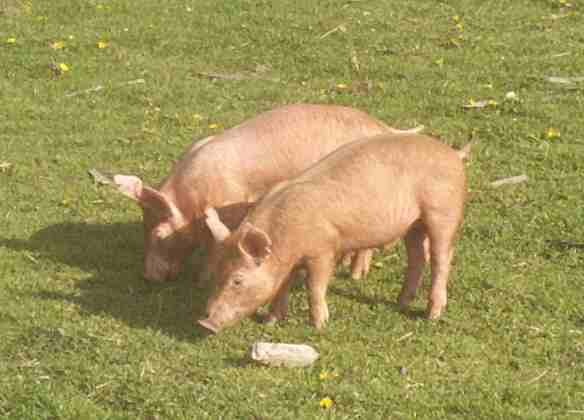 We chose Tamworths because they are a rare breed of pig from England and are noted for their delicious pork. They are also an old-fashioned breed that is considered “unimproved” by modern livestock standards. That means it does well on pasture, although does not gain weight as fast as modern breeds. 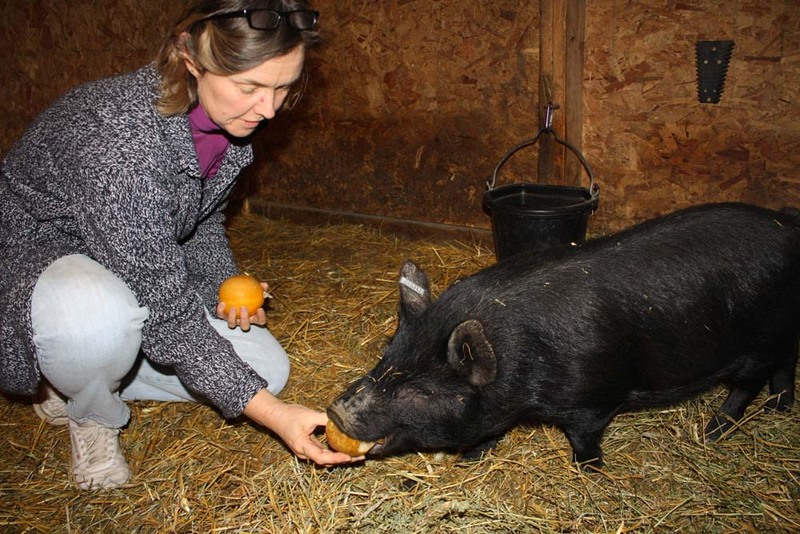 Our pigs are never given vaccines or other medications, and we have never had a pig get sick. If a pig did ever become ill, we would provide it with appropriate care. Although they live on pasture, they do have a shelter so they can get out of the sun and the wind when they want. 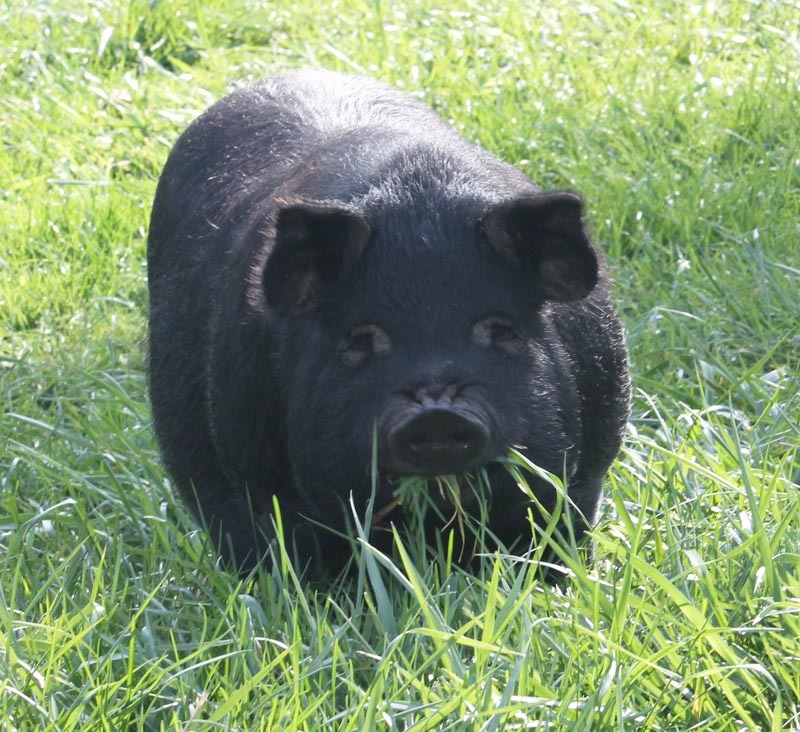 Piglets are available for purchase as breeding stock for $200 each.